Read Klook's travel guide to Barcelona to discover must-try activities and to help you plan out your itinerary! Enjoy unlimited train rides in Spain for up to 8 days with the Eurail Pass for Spain! Simply book by selecting your date of departure to Spain, along with your preferred train class & validity period, and you're good to go. Enjoy the convenience of needing only one rail pass to freely hop on and off trains in the country - no need to purchase tickets multiple times during your travels! The best part? 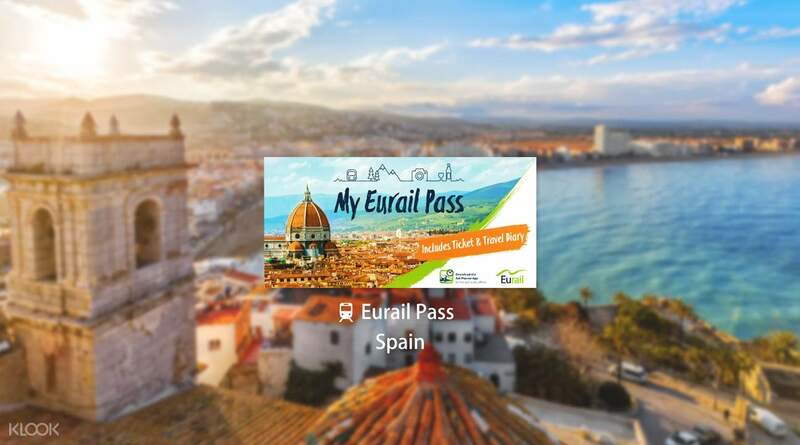 Your Eurail Pass for Spain will be delivered directly to your doorstep for free and also comes with awesome benefits like discounts on other means of transportation and city cards! Get up to 8 days of unlimited train travel in Spain with the Eurail Pass for Spain! Convenient & cost savings. We traveled started from Barcelona, Madrid, Lisbon, Faro, Seville, Cordoba, Malaga, Granada, Valencia & back to Barcelona. An amazing trip, Alhambra is the best place that I’ve been visited. Convenient & cost savings. We traveled started from Barcelona, Madrid, Lisbon, Faro, Seville, Cordoba, Malaga, Granada, Valencia & back to Barcelona. An amazing trip, Alhambra is the best place that I’ve been visited. Worth the price. Do take note that you still have to pay for the reservation fee when booking seats on the trains of your choice. Once all that is done, activating the pass is so simple and fuss free. Really recommend it! Worth the price. Do take note that you still have to pay for the reservation fee when booking seats on the trains of your choice. Once all that is done, activating the pass is so simple and fuss free. Really recommend it! The pass delivery caused some anxiety and need to self collect from courier company a day before the travel. The Spain pass require reservation and extra $$$ for the travel is a letdown. Need early planning as seat do run out. You can save more without the pass if you plan early and book the seat early and it cost cheaper than the pass. The pass delivery caused some anxiety and need to self collect from courier company a day before the travel. The Spain pass require reservation and extra $$$ for the travel is a letdown. Need early planning as seat do run out. You can save more without the pass if you plan early and book the seat early and it cost cheaper than the pass. It was the third Eurail Pass trip. Thank you for coming too soon from Shanghai Eurail. As you all know, be sure to write down your personal details and travel itinerary, and make sure you activate your pass with the help of our staff. 세번째 유레일패스여행이었습니다. 상해 유레일에서 너무나 빨리 보내주셔서 감사했습니다. 모두들 아시겠지만 개인정보와 여행 일정을 잘 적어놓는 것과 탑승 전 직원의 도움을 받아 패스를 활성화 시키는 것을 잊지 마세요.